Back in the days when I traveled from school to school teaching Music and Movement in the hcpss RECC Program, I spent a lot of time walking the hallways with my rolling cart of teaching materials. I passed a lot of people in the hallways. I made small talk with many folks in the Teachers Lounge. I learned where all the adult bathrooms were. I knew which vending machines took dollar bills if I were desperate for a Diet Coke and I didn’t have change. It was all a part of the gig. One of the people I got to know over those years was Ray Forton, the Vocal General Music Teacher at Bollman Bridge Elementary School. We had music in common, so it gave us something to talk about. I learned that, like most music teachers, he had a professional music life outside of school. He played ukulele. He taught ukulele. He even had a YouTube ukulele channel. At the time my husband had just started a ukulele club at his school as a response to student interest. It seemed as though suddenly, the world was waking up to ukuleles: relatively affordable, portable, accessible for beginners. And now they were cool. Even my teenaged daughter jumped on the bandwagon. 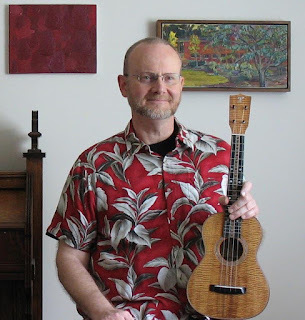 Since the ukulele craze shows no signs of abating, I thought I should let you know that Mr. Forton is now retired from HCPSS and has embarked on an all-ukulele career. (Well, guitar, too.) Should you want to learn how to play, he teaches lessons at all levels, both individual and in group settings. You can check out his Facebook page and his website. He teaches lessons both at his home in Catonsville and at Appalachian Bluegrass. During those years when I was roaming many hallways without any particular “home” to hang my hat, Ray was always a kind and welcoming colleague in my wandering weeks. If you or a family member are thinking of taking up guitar or ukulele, give him a call. His number is on his website. You’ll be the life of the party. You won’t need an amp, and no one will call the police on account of the racket.